Inventive provide ID Card systems, solutions and a full backup service to Dealers. vividcard is a popular, fully functional, easy to use ID card image capture and printing application that allows you as a Dealer to create your branded presence at customer sites. As a vividcard dealer you can personalise the product and present it to customers and prospects with your own product name and style. Simple procedures make it easy to distribute, install, support and upgrade clients. To assist you Inventive provide a full bespoke database development and integration service around vividcard. 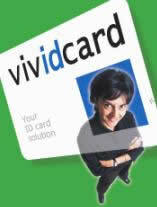 vividcard is developed and supported in the UK. If you would like further information, or you would like to evaluate vividcard, please contact us.